A casual runner can stay in good shape running about 20 miles a week. During marathon training, that needs to be bumped up to 30 or 40 miles a week. Most first time training plans will peak with a 20 mile long run and as a rule, you shouldn’t run more than ½ your mileage for the week in one run. (In other words, don't run 20 miles on Sunday and only 10 total miles the rest of the week.) Though some training plans will break this rule during the week including the longest run, it shouldn’t stray too far from that. Reality check: the professional women runners of the world run between 110 and 120 mile weeks during their peak training. Men go even further, sometimes upwards of 140 miles a week. (Quick math: that’s 20 miles A DAY. Please leave this to the professionals!) Famously, Catherine Ndereba (“Catherine the Great”) maxes out in the 90 mile a week range, but this is of note only because it’s so far from the norm. So, not surprisingly, the best in the world run a lot more than the everyday runner. The Captain Obvious’s of the running world stand by the notion that the only way to get better at running is to run. But others argue that runs whose only purpose is to add to the mileage total (termed “junk miles”) are unnecessary and increase risk of injury or burnout. Programs like FIRST and Crossfit offer encouragement for time-pressed runners, claiming that you can get better by only running a few days a week: stressing hard efforts on your on days, supplementing with cross-training, and resting completely on other days. I don’t think there’s a clear answer to this debate; I think it completely depends on the runner. Some people can handle the mileage, some can’t, and only carefully trying both styles will tell. And I do agree that each run needs to have a purpose, easy recovery runs do help promote recovery, but can also do more harm than good for some runners. In my case, I do better running more than less. 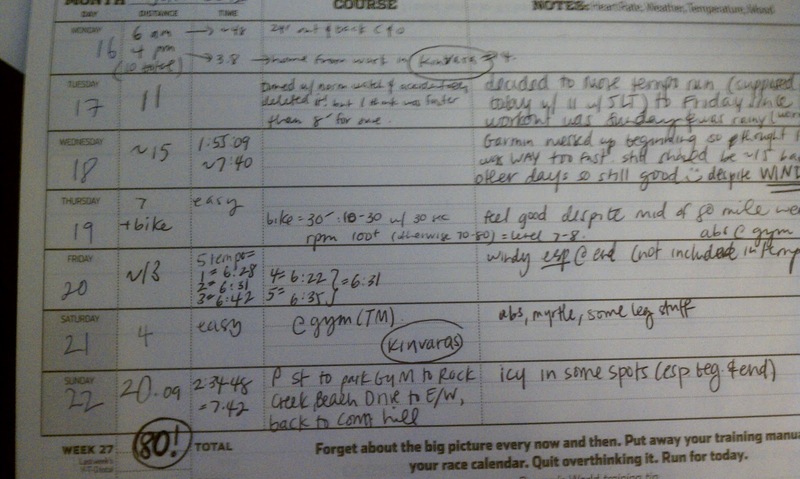 Both my confidence in my training and race times have improved with increased mileage. In my progression from a 4:07 to a 2:55 marathon, I have slowly and carefully ramped up my mileage from 40 miles per week to 50 (before NYC in 2009) and then stuck with 70 (before 2011’s Boston and Chicago, where I broke 3 hours.) Last summer I made my first attempt at getting to 80, but wound up with classic signs of over-training (slower paces in workouts, mentally drained) and backed off. In training for Charlottesville, I gave it another go. I’ve slowly added more miles and this week hit my new high: 80 miles! And, despite some soreness from this morning’s 20 miler, I feel pretty good. Of course, our bodies don’t divide things into 7 day weeks, and mine doesn’t know that I consider my running weeks to start on Monday and end on Sunday. To my legs, tomorrow won’t be the fresh start to a new week, but just another day after today’s workout. So I’ll keep being careful and seeing how my body handles this. The beauty of (and reason for) doing this now is that I can back off/take time off if I push a little too far. I have plenty of time to recover before any real attempts at the trials standard. But for the time being, I’m still proud to reach a new high. It's true. I'm hip enough to have a blog but am old school with my pen and paper running log. 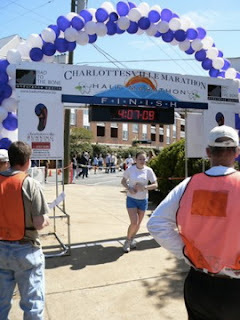 I officially signed up for the Charlottesville Marathon yesterday. I don’t know why it took me so long to monetarily commit, I have known that would be my next race for two or three months. There are a few reasons I chose Charlottesville. First and foremost, it’s a spring marathon and there aren’t many of those. (Try going for a training run at 6 am tomorrow morning and you’ll realize why.) Boston is easily my favorite race ever, but it’s a big, expensive ordeal to get there and take time off work (nobody outside of Boston actually gets Patriot’s Day off.) Since I splurged last year on two big city races, I decided to take it easy this season. Finally, I chose it because it’s a hard course. I’ve run a few easy courses the last couple races (though no one considered Boston easy until the recent relentless efforts by the Kenyans who dropped the course record from 2:07 to 2:03 in two years.) With plenty of time before the Trials, I feel like it’s important to get a challenging effort in (read: a slow time) while I can afford it. Later, I’ll need to return to the fast courses to get every bit of help I can. My brother (an Ironman who competed in the World Championships and helped pace me at my first sub 3 hour marathon, so his advice is to be taken seriously) thinks I should take some time off so as not to burn out. I agree with that; I don’t think I can keep running two marathons a year for the next 4 years. I’d like to take a season or two off and to work on my speed at shorter distances (which is ridiculously bad proportional to my marathon times.) But, as my 600-mile-away-boyfriend has recently become my much-closer-living-fiancé, and we plan to tie the knot next spring, I think I’ll be happy to focus on shorter races then, when I’m knee deep in wedding plans. Hopefully I'll be a bit faster this time around! I ran Charlottesville as my first ever marathon and my knees felt the damage of the hilly course for at least a week afterward. It will be fun to see what kind of damage I can do to the course this time around! Tomorrow are the 2012 Olympic Trials for the marathon. My money’s on Desiree Davila, Shalane Flanagan, and Kara Goucher. I don’t know who of Desiree or Shalane will win, I think the two of them will be fighting to the finish. Desiree is better on paper at the marathon distance: a 2:22 qualifying time (from Boston), a gut wrenchingly close loss in Boston by two seconds, and steady progress that has finally solidified her at the top of American marathoning. But Shalane is FIERCE. She will not go down easy; she likes to set the pace and is tough. She’s only raced one marathon (second place at NYC in 2:28, a harder course than Boston) but she’s also got a bronze medal from the Beijing Olympics (10k), a bronze from last year’s World Cross, and has set a slew of American records. So my money’s on those two, but my heart is with Kara. She started running marathons about the same time I did (I remember watching her get third and set an American debut record a few weeks after I qualified for my first Boston) and for whatever reason, her story stuck with me. In interviews, she’s honest and down to earth and determined to bring Americans back into the marathoning spotlight. She sets her sights high and she’s not satisfied with anything less than a win. I have watched her disappointing loss in 2009’s Boston (by 9 seconds, for third place) multiple times, and each time I scream at the TV hoping and wishing she’ll somehow go back in time and pull out a win. She ran a new PR (2:24) for 5th in last year’s Boston (behind Desiree, and the 2nd fastest qualifying time heading into the trials) only a few short months after having a baby. She hasn’t had a huge breakthrough in the marathon, but I certainly think she deserves one. She’s tough, and she’s recently started training with Shalane, which will certainly keep her honest. But in interviews leading up to Saturday’s race, she seems unsure of herself (once again, her training has been slowed after returning from an injury.) Everyone else’s answers to questions about preparedness and nervousness were typical and of the vein “I’m confident because my training is better than ever; I’m not nervous, I’m excited; I know I can make the team” but Kara seemed to not have memorized her script. Her answers were honest and nervous, and involved admitting she wasn’t sure she’d make the team. I think Desiree and Shalane will be fighting for the win the last few miles, while Kara will be fighting off the marathon trials veterans (Deena Kastor, Magdelana Lewy Boulet) and the newbies (keep an eye on Amy Hastings, a 2:27 runner). I really hope she can do it, and can keep her confidence!! I’ll be watching it on TV hours later, but screaming my heart out anyway. Four years ago, I watched the 2008 women’s Olympic Trials marathon in Boston. My sister and I tried sprinting a few hundred yards to see if we could keep up with the amazing women competing; they left us in their dust. At the time, I was planning my own (less momentous) return to the marathon. I had planned (in college, three years prior) to run only one marathon, check it off the old bucket list and be done with it. I succeeded, in a respectable 4:07. For a few years, that was enough. But then I got a typical 9-5 job, and a boyfriend who lived 600 miles away, and I needed something else to do with myself. 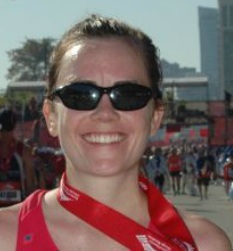 The next obvious goal was running another marathon and trying to qualify for Boston. I thought it was nuts, and would take multiple tries, but the confidence and lessons learned from my first gave me a huge PR in my second marathon, and I qualified. So then, obviously, I had to run Boston, now that I was among the privileged few whose blood, sweat, and tears earned them a spot there. I remained under the illusion I would quit marathoning after that. But somewhere in the dark, cold mornings training, or more likely on the hallowed path of the Boston Marathon, I realized I was in this for good. Afterwards, needing a new goal, I decided I'd run the other American Marathon Majors: NYC and Chicago. 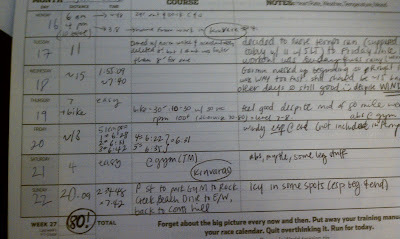 While training for those races, I started dreaming of new, completely unrealistic goals. I wanted to break 3:00. I wanted to win a race (and I didn’t care how small or unpopular it was). I wanted to qualify for the Olympic trials, the same race I watched in awe only a few years ago. Most of the time, these dreams seem ridiculous and overly optimistic—akin to singing tone-deaf into your hairbrush and thinking you could win a Grammy. But I’ve now completed 8 marathons (2 Bostons, 2 Chicagos, 1 NYC), and broken the once impossible goal of 3:00 twice. Now the 2012 marathon trials are upon us and I'm beyond jealous I'm not lining up there. Compared to where I was four years ago to where I am now, I'm confident that, given four more years, I can make it to the 2016 trials (Does that sound too much like an election promise?? Just give me four more years!!) Of course, each additional minute will be exponentially harder to take off, I won't even know the qualifying standards for at least another year (the women’s dropped from a 2:48 to a 2:46 between 2008 and 2012, but the men got rid of the B standard completely in that time), and the qualifying window won't open until 2014. But I aim to continue dropping my PR and working at this until I reach whatever standard they set. I hope you'll enjoy following along with my progress, whether you're a first time marathoner needing fueling or training advice, or a seasoned veteran wanting to read about someone else who manages a full-time job, a serious running obsession, and an attempt at a "life" beyond the two. If it motivates you to get out and run a marathon, try to nail a time goal, or just go out for a run, I'll be happy!